First impressions count – which chassis should you choose? One area that couldn’t fail to generate excitement in 2014 was chassis. You normally expect case manufacturers to deliver one unicorn followed by a dozen donkeys, but this year the overall standard felt higher. Quite a few thoroughbreds separating the extremes. Arguably the most entertaining company was In-Win, with a stream of ‘out of the box thinking’ ideas that were great for the market. That kind of design and development work reminds us of the concept cars that grave major motor shows. In themselves, they may not go on to be the a ‘number one best seller for the year’, but each of them puts down some kind of marker – to let enthusiasts (and other design companies) know that originality is possible. The chunky-monkey D Frame Mini, smooth, stylish 70’s retro 901 and the stunning S-Frame certainly did that. Head-turning looks are not everything – and we need to keep an eye on cooling, ease of use and affordability – but we did feel that InWin’s consistent drive toward creating something new and different needed to be recognised. KitGuru’s very own bike racing specialist fell truly, madly, deeply in love with the In-Win D Frame Mini – warts and all. 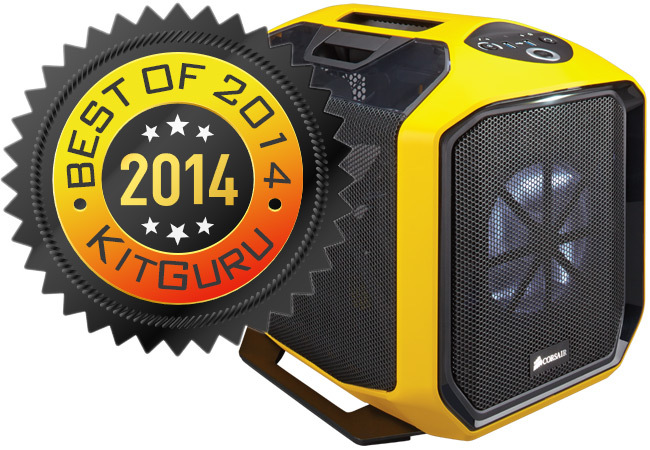 KitGuru’s choice for Design Innovation of the Year 2014 goes to InWin. Read our review of the amazing in Win D Frame HERE. From the first time that George took us around the Corsair Graphite 380T chassis at Computex, we knew they were on to a winner. Still, you can’t jump the gun with these things – so it was only after KitGuru Labs put it through its paces that we we let our heads follow our hearts. Reminiscent of the pioneering work that took place around Scan’s Isotope systems, the Graphite 380T is a thoroughly modern take on a classic idea, “If you had to build an ideal LAN gaming chassis – that needed to house a full system, yet be easy to lug around the country – what would you design?”. Is it perfect? No. It could be easier to work around inside, there could be better cable management and there’s no legacy optical drive bay – but it is still a cracking chassis. Also, like last year’s Aerocool DS winner, it comes in cool colours – giving gamers a chance to express themselves without needing a spray paint gun. 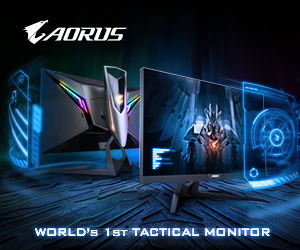 From the first time we laid eyes on this beauty in a private room at Computex with George, one of Corsair’s very own gurus, we were impressed. It lived up to all those initial expectations. 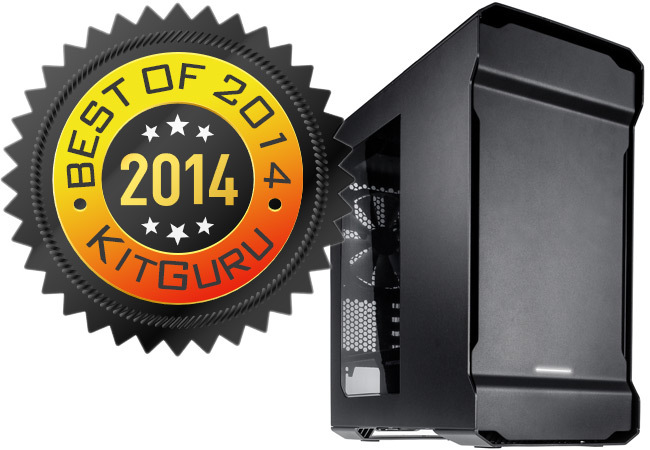 KitGuru’s choice for Mini ITX Chassis of the Year goes to the Corsair Graphite 380T. Read the review HERE. The most popular case size, globally, yet so often in the past it was largely targeted with low-cost designs that did nothing for the imagination. Not sure what we mean, just think about every HP, Dell or Acer desktop you remember from the past 10 years. Meanwhile, in the gamer/enthusiast space (i.e. the land of the KitGuru reader), design ideas have been proliferating at a tidy pace – with corresponding increases in quality and featureset. At the end of October, a rather fetching white chassis arrived at KitGuru Labs. It’s novel design was tool-free with plenty of dust filters. 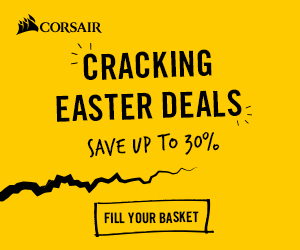 Build quality and cooling matched what you would expect from a quality ATX chassis, yet the price (at the time of writing) is just £89 – affordable even for a system costing less than £1,000. You can watch it being taken apart by Leo over here. 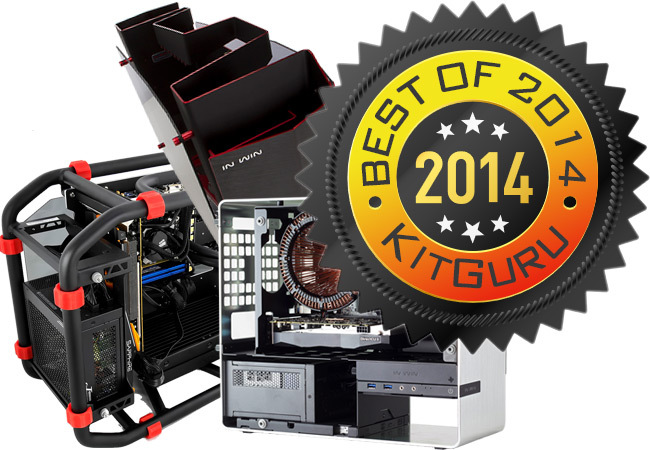 Our choice for Micro ATX Chassis of the Year is the Phanteks Enthoo Evolv. Read the review HERE. When you review as many chassis as KitGuru, you’ll realise that no matter how good a case is – we will always try to find its weaknesses. Nowhere is that more true than the ATX chassis category. Why the overly harsh approach? Simple. There are almost no size, price or layout restrictions. While the Mini ITX designers have to deal with horrendous issues of space and airflow, the ATX designer has no such challenge. They can do, pretty much, whatever they want. In some situations that leads to the monolithic Cosmos II or Storm Trooper, in others it leads you to one of Zardon’s all time favourites, the super stylish Lian Li X2000FN. One thing all 3 of those cases have in common is a serious price tag, but this year’s winner is different. 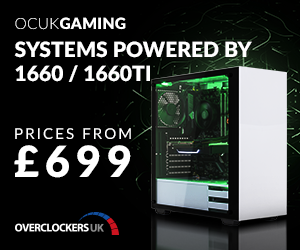 At the time of writing the Fractal Design Define R5 is just £83 (although the windowed-side panel version will set you back around £12 more). 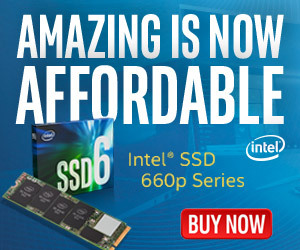 Despite the price, it does almost everything you might need, very well indeed. When we finished with it in the KitGuru Labs, our ‘negatives’ list included classics like ‘Could have had 9 mounting points instead of 8’. It’s a great case and, at this price, you can mod it to your heart’s content. 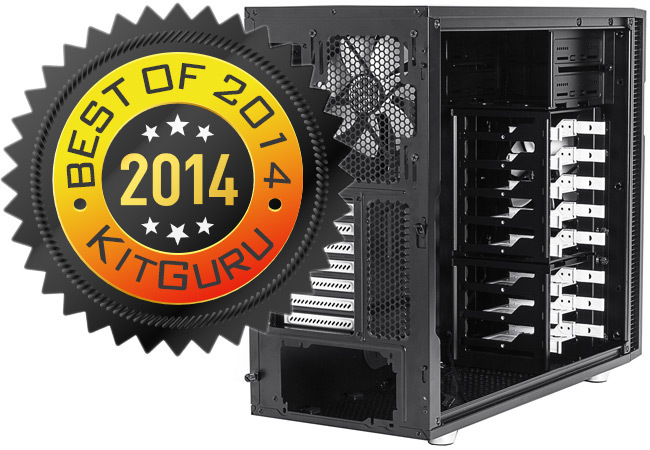 KitGuru’s choice for ATX Chassis of the Year is the Fractal Design Define R5. Read the review HERE.